December 26, 2018 by Dr. Randi Fredricks, Ph.D.
A school bully named Joey is making life miserable for Eddie (Brandon Cruz). Joey (Jodie Foster) is a girl — just one of the situations in the 4, Disc 26-Episode Complete Season One of The Courtship of Eddie’s Father, the warmly remembered sitcom centering on the relationship between magazine executive Tom Corbett (Bill Bixby) and his grade-schooler son Eddie, who hopes to find the ideal wife for his widower father and a great mom for himself. Helping make the father-son household a happy, high-spirited home is the Corbett’s housekeeper Mrs. Livingston (Miyoshi Umeki). Glenn Ford and Ron Howard played the father and son in the popular feature film that inspired the TV series. I grew up watching this cute and funny show. A show about a recently widowed father and his young son. The chemistry between Bixby and Cruz are really what make this show such a treat. Of course the supporting cast is also good with Mrs. Livingston the housekeeper, Uncle Norman and Tina two friends of the two. Even the dated late 60’s theme doesn’t hurt this show because the real values haven’t changed or at least they shouldn’t have. The show holds up surprisingly well and all 24 first season episodes are here on this four disc set. They look quite good too and it doesn’t appear that anything is cut out as they run around 26 minutes each. The theme song is also unforgettable and is an important part of the lead in for each episode. Nilsson wrote and performs the catchy number and he adds variations of the theme throughout the episodes. I grew up watching this cute and funny show. A show about a recently widowed father and his young son. The chemistry between Bixby and Cruz are really what make this show such a treat. Of course the supporting cast is also good with Mrs. Livingston the Asian housekeeper, Uncle Norman and Tina two friends of the two. Even the dated late 60’s theme doesn’t hurt this show because the real values haven’t changed or at least they shouldn’t have. 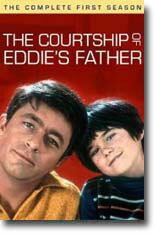 Character to watch: Bill Bixby as Tom Corbett. Journal your answers to the following questions after you watch the series. How does this particular character’s journey compare with yours? Did the character develop certain characteristics during the movie that you have or that you would like to have? If so, what are those characteristics? What obstacles did this character face? What was his or her biggest challenge? What would you have done differently if you had been in the same position as the character? Is this character the type of person you would be friends with? Why or why not? Click here to order this DVD Collection at Amazon.